Antivirus suites with lots of features tend to focus on detecting and managing threats first, and then throw in some “tune up” utilities as extras. PC Matic 3.0 from Iowa-based PC Pitstop takes a very different approach. This software is instead an optimization tool for your PC with antivirus being just one part of that larger whole. That focus on optimization is made clear the moment you see PC Matic’s Nascar-like aesthetic or that of PC Pitstop’s site—even the name gives it away. In the world of PC Matic, your PC needs to be a finely tuned machine primed and ready to deliver the performance you require. PC Matic 3.0’s default dashboard. PC Matic is just so odd. I don’t say that as an insult but an observation. After reviewing nearly every major antivirus product over the past year, I’ve never run across a program quite like this. 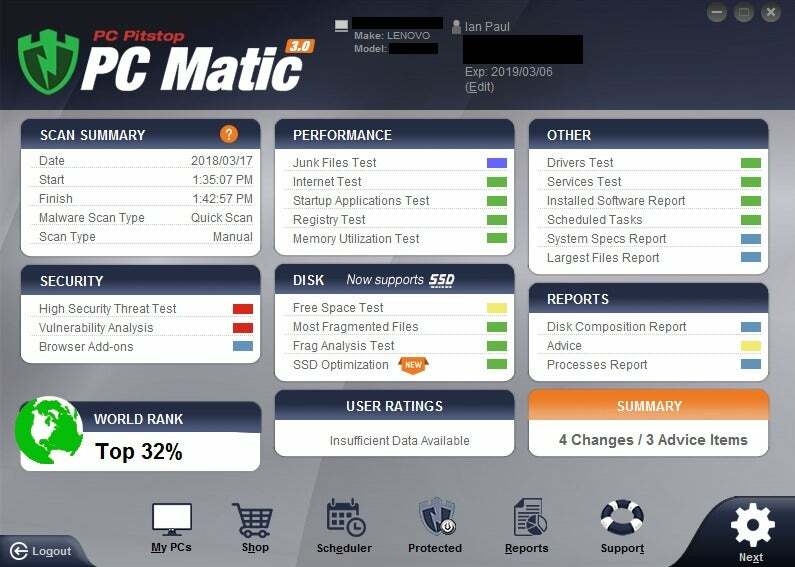 You don’t scan your PC for threats in the traditional sense with PC Matic. 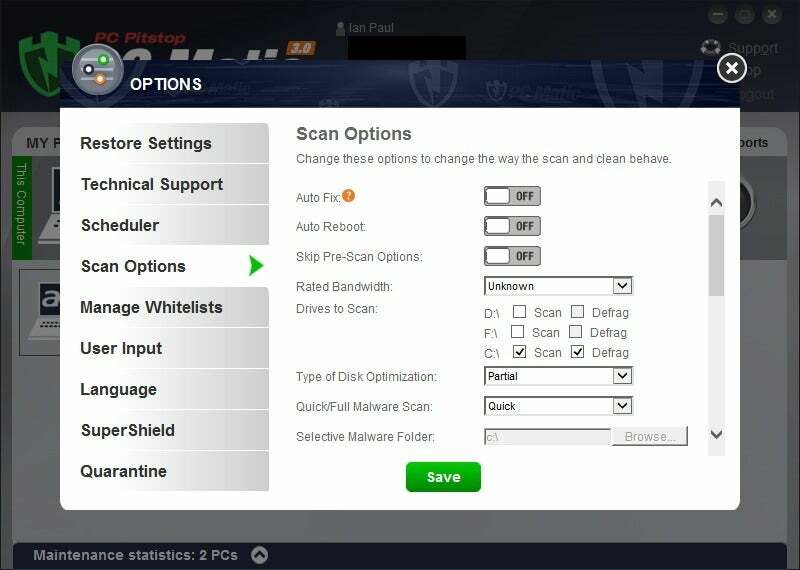 Instead, you run a scan on your PC for a whole host of issues including disk fragmentation, benchmark performance, and oh yeah, malware. First, however, PC Matic has to do a diagnostic scan to see where the problems are. The diagnostic has four major components: Maintenance, Stability, Security, and Performance. During these diagnoses, it scans for junk files, checks for disk fragmentation, craplets, broadband quality, driver updates, various forms of malware and other security threats, and then runs a series of benchmarks. You can run just a pure malware scan if you prefer by unchecking options, but the default is to approach all of these as equally important. PC Matic 3.0 after the initial diagnostic scan. Once the diagnostic scan is finished, you get your results. All the various issues are color coded. Red indicates a failed test requiring your attention, green means the PC passed all tests for that issue, gray means a skipped test, blue is informational, yellow means advice, and purple indicates a suggested but nonessential tweak. Clicking on the color codes shows you what the problem is, including the problematic file or out-of-date software. Once you’ve reviewed everything, you click Next and you’ll see a screen with all the various suggested actions. Uncheck any of the items you don’t want to fix and select Continue. One thing I noticed in this process was that PC Matic suggested defragmenting my C drive. The only problem with that is my drive is an SSD. Common wisdom says you should not defragment an SSD—though not everyone agrees. 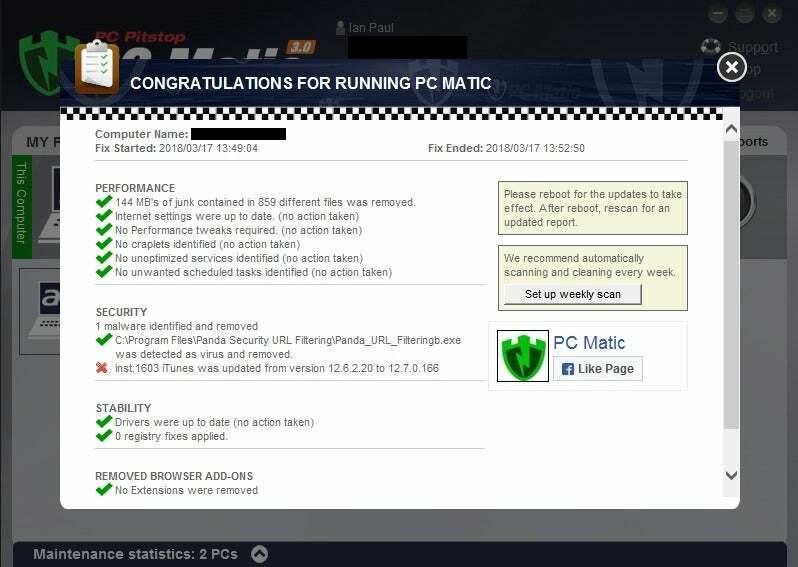 I asked PC Pitstop about this and the company said that PC Matic normally detects when someone has an SSD, which suggests my experience was likely an anomaly. 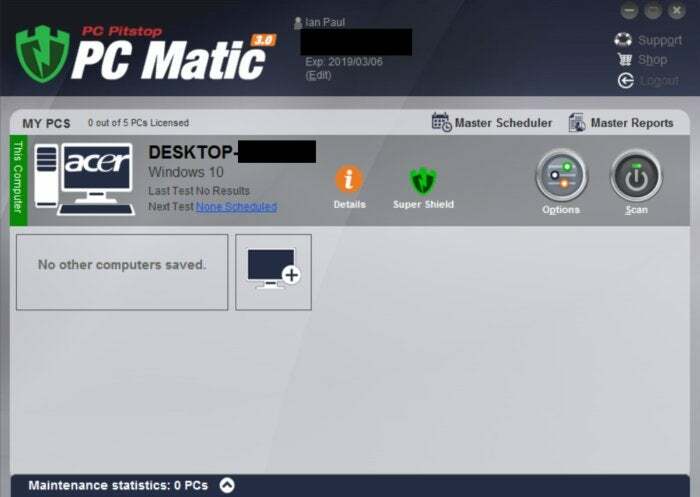 One really nice thing about PC Matic is that you can see the status of all PCs connected to your account directly in the desktop program. Click on the name of the PC, and you’ll see a dashboard summary with speedometer-like statuses for the most recent RAM, CPU, and disk usage. Below that there’s also information about that PC’s statistics, including viruses found, patched vulnerabilities, disk defragmentation, and so on. Here, you can also schedule scans and view performance trends charts. That’s really the bulk of PC Matic’s desktop program. It carries out all of these items at once. There are a few features you can tweak, however, by clicking on Options from the main dashboard. PC Matic 3.0’s Options screen. By default, for example, PC Matic does a quick malware scan, but under Options > Scan Options > Quick/Full Malware Scan, you can change that to Full, or Selective to scan a specific folder. You could also turn on a registry cleaner, which is turned off by default. One feature that I did have problems with in PC Matic 3.0 was SuperShield. This is the program’s active scanner that looks at programs and files in real time to prevent active malware operations. In my tests, however, PC Matic stopped virtually every mini program PCMark 8 used for benchmarking. It also wouldn’t allow an uninstallation utility to run for a lesser-known VPN. One of the differences with PC Matic 3.0 is that it uses a whitelist approach to programs. Meaning that by default it only allows programs it knows are trusted to run. This is in order to stop ransomware and other lesser-known malicious programs from ruining your day. That’s all well and good, especially compared to blacklists where an antivirus suite keeps a list of disallowed programs (instead of allowed programs) that make it easier for unseen malicious programs to sneak past. The list approach is the old way of doing things, however, as more and more antivirus programs are turning to behavioral analysis and artificial intelligence to deal with pernicious malware. 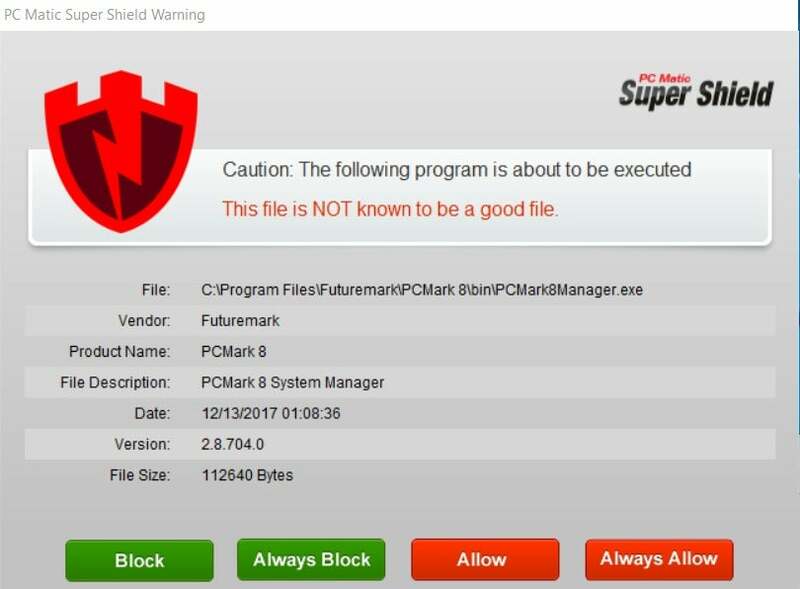 Under normal circumstances I would’ve just turned off SuperShield after it annoyed me one too many times, but since I wanted an accurate picture of the program’s performance I had to whitelist every EXE file during PCMark’s first pass. It was a pain, and to be fair it was the only time I experienced overzealous activity on PC Matic’s part. As for pricing, it’s fairly standard. You can pay $50 to cover five PCs for a year or $200 for lifetime coverage for the same number of computers. For 10 PCs, you pay $100 per year or $400 for lifetime. The lower pricing option is unusual, as is the lifetime option—most antivirus suites are priced at $100 for 10 devices including Bitdefender, Bullguard, McAfee, and Norton. In its July 2018 tests, AV-Test gave PC Matic a score of 97.5 percent for its zero-day, web, email, and malware attacks test based on 225 samples. The organization’s larger malware test with 5,565 samples scored 100 percent. PC Matic was not a part of A-V Comparatives’ or SE Labs’ tests in recent months. As for our in-house performance tests, overall PC Matic had no significant impact on performance based on the PC Mark 8 benchmarks. Without PC Matic installed, the test PC had an average score of 2,493; after a full scan with PC Matic the average was slightly lower at 2,484. There a few caveats with PC Matic. First the antivirus does not function in offline mode, so all tests were run with Wi-Fi active. Second, PC Matic required a reboot after each scan and then a subsequent scan to complete the process, which was done each time. As far as the Handbrake test goes, again there was no change. The PC reencoded a 3.8GB MKV file to Handbrake’s Android preset in one hour, 14 minutes, and 36 seconds. With PC Matic running; after a full scan that time went up by 19 seconds to one hour, 14 minutes, and 55 seconds. Overall, PC Matic is an interesting program. It’s odd compared to other AV suites and will take some getting used to with its optimization focus. That’s not only because of the whitelist approach, which can be problematic, but even running something as simple as a manual malware scan takes a higher degree of user participation than other suites. But at $50 for five devices, it may appeal to those looking for an antivirus suite on the cheap. What is agile marketing and should you be sprinting to it?